Testing for radon gas is a frequent topic during the course of a home inspection. In a hyper-paranoid world where something is good for you one day and hazardous to your health the next day, how do you know whether or not to worry about exposure to radon gas? Let’s look at a few facts. 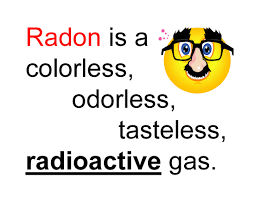 Radon gas is formed as uranium in the soil, rock or water breaks down or decays. It is the only uranium decay product that exists as a gas. All the other decay products are solids. During the 3.8 days that it exists in a gas state, radon can enter the home through cracks and openings in the slab or foundation. In most cases radon levels in the home are highest in the basement. Harmful exposure occurs when a person inhales this invisible, colorless and odorless gas. Long-term exposure to radon gas causes lung cancer. The EPA (Environmental Protection Agency) estimates that approximately 21,000 people a year die from lung cancer linked to radon gas. The EPA has established a limit of 4.0 picocuries/liter of air for increased risk of lung cancer. Anything above this radon level should be reduced or mitigated. A radon mitigation system is typically installed to reduce the radon gas to a safer level. By the way, radon gas is even present in outdoor air at an average level of about 0.4 pCi/L. The only way to know whether or not the level of radon is elevated in your home is to conduct a test. The EPA publishes different guidelines for radon testing in existing homes versus testing a home as part of a real estate transaction. Radon test kits are available from a variety of sources including home improvement centers, hardware stores and online sources. However, failure to meet the required testing conditions will give invalid results. That means if you don’t follow the directions to the letter it’s a waste of time to test. You won’t be able to depend on or take any action based on invalid findings. You should seriously consider hiring a certified radon measurement professional to conduct a radon test, especially when testing a home that you are buying. It will cost you a bit more, but it will be done properly. Many home inspectors offer radon testing as an optional service, but most of them are not certified. Always ask if your inspector is certified to provide the radon test and ask for his/her credentials.